I've enjoyed the Ensemble RXTX kit build but I'm having a devil of a time with audio under Windows XP. 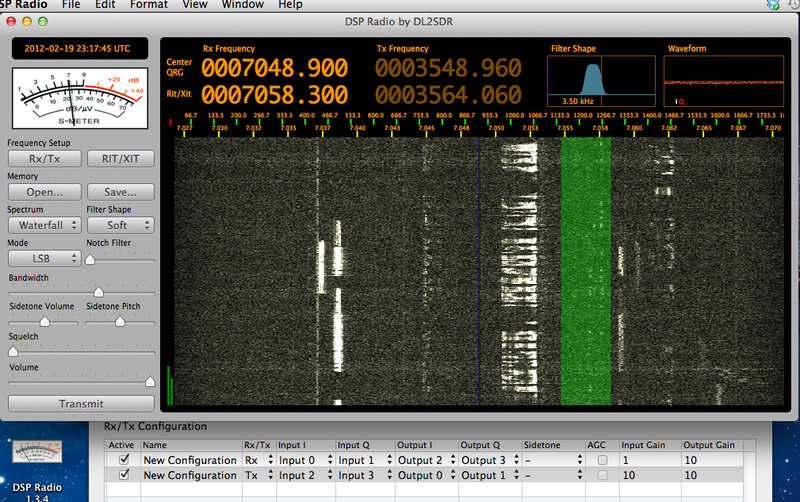 There's not a lot of ham radio software for MacOS but there is an SDR program called "DSP Radio" from Sebastian Mrozek, who has been very helpful in getting me past some problems I ran into. The instructions with the software are a little brief and so I wanted to capture my working configuration here for future reference. 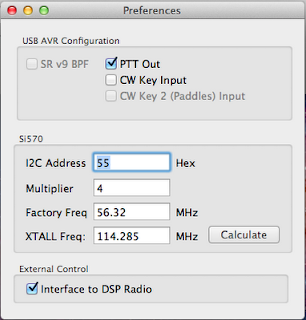 I'm using a MacBook Air with an Edirol USB audio device for sending and receiving I/Q signals from the Ensemble RXTX. USB control is via TODO which links to DSP Radio. Plug in the external audio device. Then run the Apple "Audio MIDI Setup" utility (in the utilities folder). Create a new Aggregate Device and add the external USB device and your built-in audio (for your headphones and microphone). Make sure to set all the devices to the same sample rate. Set the external USB audio device as the clock source in the popup. Turn on the Drift Correction checkboxes (called Resample under 10.6) for the built-in microphone and built-in output. Open the Audio devices window in DSP Radio. Select the Aggregate Device as both Input and Output. 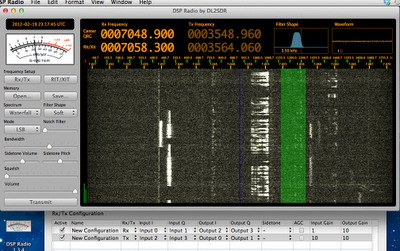 Open the Configuration window in DSP Radio. (If there is an existing audio configuration there, just leave it and make a new one, then go back later and delete it). Add a new audio configuration. First make a receive (Rx) configuration. Unfortunately the name of the devices within the aggregate are simply numbered: Input 0, input 1, input 2, input 3; so you need to play around to figure out which is which. I did this by choosing inputs and whistling until I saw my trace on the waterfall - that meant I'd found the microphone. In my case I/Q from the radio was Input 0 and Input 1 but it may come up differently for you. Play with the Output popups until you get audio through your speaker. For me it was Output 2 and Output 3. Don't worry that the heading says "Output I and Q", that's for transmit. In the receive context it's just audio out to your speaker. Note that the audio level was very low for me and I had to increase output gain to hear radio signals. Here's a screen shot with everything working. The second audio configuration line is for transmit. Transmit configuration is similar. Make a new configuration. Select Tx. Choose the inputs from the microphone channels in your aggregate device. Choose the Output I & Q for the external USB outputs to the radio. Andrew Nilsson has contributed SoftRock-USB-Controller-v1.2.zip which talks to the Ensemble RXTX and also links to DSP Radio so that changing the frequency in DSP radio updates the Ensemble. (The file is hosted in a Yahoo group under VK6JBL - you have to join the group to access it unfortunately). The transmit button in DSP Radio also sets transmit in the radio. Great stuff. Most of my problems have been sound related under Windows XP so I switched to a laptop running Windows 7 and had much more success. Here's my first contact with VK2HLG - thanks Dave for taking the call. Sorry about the low receive audio on this one, I'll try to get a better recording next time. Peter, The link you posted for the Softrock usb i2c controller doesn't go anywhere. Good post none-the-less! Thanks for pointing that out. I've fixed the link but it's to a file hosted in a yahoo group so you'll have to join the group to get it. I am using this to setup my Peaberry and I am finding that it works without the USB-I2C controller. However I cannot make the DSPRadio Transmit button work. Only the left keyed paddle will initiate transmit on CW and SSB. Any clue how to fix this? 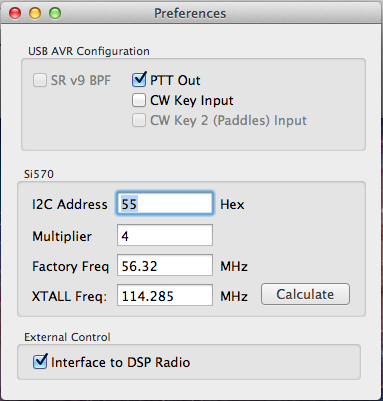 I am trying to run my Softrock Ensemble RXTX with DSP Radio on a new iMac. I have been trying for days to get it to transmit. I am not sure how the Softrock-USB-Controller fits in to the picture. It is asking for a hex address for the IC2 module. Is this some hardware thing I have to purchase to get the RXTX to talk to the iMac? I will try to send you a screen shot of all my configurations, which seem to work for receive and in some way for transmit; I just can't seem to get the RXTX to actually transmit. Yahoo Groups is experiencing issues with file hosting, and I have heard rumors that Yahoo is trying to get out of the "groups" business. As such, it looks like the request membership for the group has been removed. Or I've gone blind. Any chance you could ask the developer to let you host the file? I haven't been able to find the file. As you suggest, I'll try to contact the developer and will update when I have any news.